← The Gritty Side of Love. Grit, Garlic and Not At All What Was Expected. Mum almost ready to go home, happy and confident with grandson Isaac. True to form, Mum was shifted to a rehab facility. Although old and quite institutional, we knew that with the coming health changes in our state, not a lot of money could be spent on the facilities, so share wards and bathroom and toilets were the go. The gardens were beautiful and families could be there easily. The therapists were excellent and Mum was enthusiastically making every effort to do any exercise given and more, and was making a very good recovery. Mum was walking without supervision or support with her never before used walker. She could get in and out of bed and walk outside if she chose. She was back to her crosswords and soduku. We were invited to a planning meeting re her coming move to home based care. There were a few issues re food provision as mum is allergic to garlic. It did take many representations to convince some of the staff that this was a real problem. Mum could have just eaten a meal with garlic, but she would have experienced severe diarrhoea, pain and nausea – for quite some hours afterwards. The only accommodation was for her to be given a punitive plain white bread sandwich for two meals a day, as if she was a small child fussing over her food. We were repeatedly told that ‘the kitchen said all food is cooked with garlic these days’. Eventually enough staff realized they themselves were the beneficiaries of her not eating it, that the kitchen existed for the patients not vice versa, and the family could stop having to bring 2 non-garlic meals a day from home. It took 5 requests from family members. Perhaps looking back, we should have realized this indicated something institutionally systemic about attitude, but we didn’t pick it up. Four nights before the exit planning meeting, at 10.30pm, mum complained of severe pain in her abdomen. Now our mother is not one to fuss about pain – she has lived with all sorts of pain for many years and is as courageous and tough as the proverbial boot. If she says she is in severe pain, she means it. She said it felt as if she was having a bleed – and she has had several so she knows what that pain feels like. She was offered two Panadol, and it seems there was no follow up all night. She was still at a horrendous pain level when the doctor came the next morning. (I am not blaming him – I do not think he had been called). At 10 am one of my sisters arrived at the hospital unannounced and found a flurry of ‘happening’ around the bed. Mum was completely white from lack of blood – her blood count was 47, less than half of what it should have been. When I saw her at 2pm she was so white I had to look twice to be sure she had not died. To shorten this story, she had bled all night into her abdomen. When the ambulance my two sisters requested arrived, the officer had to ask for her to be given pain relief, 12 hours after she had called the nurse. There was something mystifying about how mum left the hospital. The staff stood in a row by her bed, silent and observing. They didn’t speak a word of comfort. Not one of these people who had known her for about ten days seemed to remember that she was a person – and that she had full faculties and the power of speech. The ‘ambo’ God bless him, was the one who reassured and comforted her, and told her he would give her extra medication for the journey as she was still in too much pain to be moved. 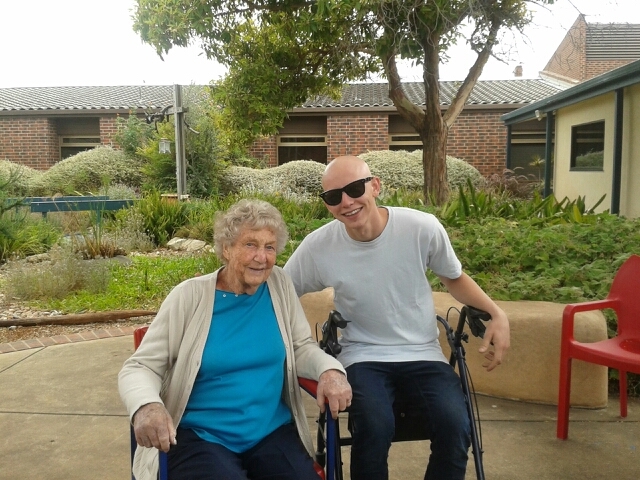 Mum was treated well with clotting agents and transfusions and admitted to a ward in the Royal Adelaide Hospital. She has been very well looked after, but the consequences are huge. She has lost all the improvements in strength that she had made, and more besides, and has to start all over again. This time she feels weak and discouraged, and very apprehensive. At 91, finding the energy to face the unknown all over again is tough. Sometimes to her it feels impossible. She has repeatedly expressed that she would rather she had died – that same person that had a rocking party, complete with Irish dancers, for 120 of her family and friends last year. (She came with me to the bottle shop to do the order herself, as she suspected I might go a bit light on). We are meant to be her supporters and encouragers now, and we will be. I ask myself, though, how do I balance this with listening to her grieving her shattered confidence, her loss of her hopes for the kind of future she wanted, the loss of her life as she knew it, and her appraisal of what ‘getting better’ means. Where is the space for her mourning her losses while at the same time she has (necessarily) to do all she can to focus on what can be achieved? Yes, she is better and yes, she is worse. It is a roller coaster of emotions every day. The worst is trying to come to terms with the knowledge that while she and we knew she was at risk of a bleed (and so did the rehab staff) the severity of both the pain and the consequences were entirely unnecessary. Oh and that when the head doctor from the rehab facility called by in the RAH ward, we discovered that the extent of the happenings that night had not been disclosed to her. I draw no conclusions, but you can bet she will. Grit grace confusion anger gratitude sadness frustration pain love love love – and my seventieth birthday is certainly one I will never forget. This entry was posted in change, family, hope, life, outrage, sadness, spirit, Uncategorized. Bookmark the permalink. 4 Responses to Grit, Garlic and Not At All What Was Expected. So sorry to hear and the pain and encouraged by the depth of love the takes us to the edges. Thanks Karen. You and Bernie know all about the uncertainty road. It is tough.